The most serene and calming experience, never was learning more delightful. Start on the road to being a true tea connoisseur! The Tea Lover's Masterclass is £55 per person. Press the ‘pause button’ on life and completely unwind. Enjoy a delightful interlude in the calm oasis of teanamu chaya teahouse. You will lose all sense of time! 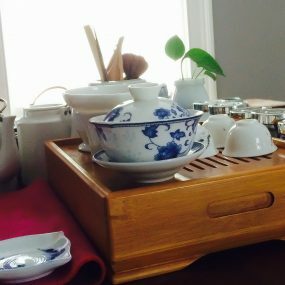 Take part in the beautiful Chinese ‘gongfu cha’ tea ceremony under the gentle guidance of our friendly expert tea master while he shares with you his love of tea. You’ll discover how to appreciate the finer nuances of tea like a true connoisseur, yet in a light and relaxed setting. You’ll be introduced to gorgeous teas with fascinating, evocative names like ‘snow buds’, ‘honey orchid phoenix’ and ‘dragon well’. The incredible range of flavours and aromas will amaze you. Tea Lovers Masterclass lasts about 2 hours and costs £55 (includes a selection of our gorgeous, fresh patisserie). It is held on selected Saturdays at 10am. We reserve the right to impose a quorum of two participants for each class. To buy a Gift Voucher for this masterclass, please click here. ~~ We understand occasionally bookings have to be cancelled. Minimum cancellation period of two (2) weeks before the class date, please. Cancellation by email only. Participants can transfer to another published class date, subject to availability, if the cancellation is made more than 2 (TWO) weeks before the class. No refund will be provided.